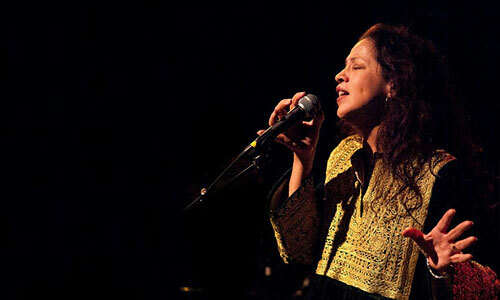 Grammy-nominated singer Perla Batalla possesses not only a signature voice known to summon soul-stirring depths, but the professional and personal clout to pull-in a slate of heavy-hitters when she decides to throw a party. And party is exactly what patrons of Thousand Oaks’ “Live at the Library” got for the closing show of the season at Grant R. Brimhall Library on Saturday night, dubbed “Perla Batalla: Songs and Sundries Variety Hour.” The Ojai resident and former back-up singer to Leonard Cohen hosted, with grace and humor, two generous sets of music, sharing the stage with a dozen or so musicians from her personal and professional family circles. The effect was pure enchantment. “I grew up watching Carol Burnett and Engelbert Humperdinck,” Batalla told a capacity audience, relating the genesis of the idea. But those of us who have seen the film, Leonard Cohen: I’m Your Man, can think of a more recent example of a variety concert that Batalla played a role in. The evening rotated through subsets of the singers and instrumentalists, ranging from light-hearted songs by Batalla’s brother, Ovation Award-winning actor and writer Rick Batalla, to a cerebral work for solo piano written and performed by television and film composer/producer/keyboardist Dave Palmer. Rhythm dharma for the evening was solidly braced by Batalla bedrocks Gilberto Gonzales on bass, young wonder drummer Alejandro Medeles, Claud Mann (Batalla’s husband) on congas, with special guest Grammy-winning composer/producer Jon Gilutin on piano, whose improvisational visions blissfully filled a multitude of song choruses throughout the night. Also gracing the stage, pairing up with Palmer was (yet another multi/accomplished/etc.—are you getting the picture?) singer/guitarist/film composer/Grammy-winning mixer, and founder of Brotheryn Studios in Ojai, Todd Hannigan. Long-time Batalla recording collaborator Jeff Evans teamed up with Mini Bar Project partner Marty Van Loan for the title-cut to their forthcoming EP release High, a light-hearted love song that invited audience sing-along. The comedic cornerstone of the evening was Rick Batalla, whose stage banter with his sister, and musical theater-style tunes accompanied on ukulele brought the house down. Rick, a lyricist with an ear for sharp rhymes (who claimed never to have stepped into a library before—clearly an old family bone) wrote a duet for the occasion, sung with Perla, about the brother and sister relationship. Think “Donny and Marie minus the Mormon”according to one line; “you put the bling into sibling” camped-up another. Eva Batalla Mann, daughter of the singer, sang a striking cover of ­­­­Jessie Ware’s “Wildest Moments,” and unquestionably demonstrated that the musical fruit has fallen very close to the tree. Fans of Perla Batalla’s work were rewarded with a selection of songs spaced throughout both sets that touched on her Latin roots, her Cohen period, her Mestiza albums and present collaboration with her longtime writing partner David Batteau. Batteau took the stage with guitar and backup vocals for a haunting revisit of “Iberia,” from Batalla’s 1998 album Mestiza. Batteau and Batalla also gave tantalizing glimpses from “Blue House,” a musical they are writing based on the life of Frida Kahlo. The two tunes unveiled, “Awaken” and “Drunker than the Sun,” happily proved that the potent creativity running through the albums Mestiza and Heaven and Earth is alive and well. The aching ballad award of the evening would have to go to a touching cover of The Blue Nile’s “Because of Toledo,” with Batalla accompanied by Dave Palmer on piano. The American Songbook found a seat at the table, too, with a Latinized take on the Nat King Cole classic, “Nature Boy,” including a catchy vamp that pulled in audience participation. If you are thinking by now that this evening could end in only one possible way—you are absolutely correct. All the guests took the stage one last time for Cohen’s “Hallelujah,” and the ‘secret chord that pleased the Lord’ resonated everywhere. This entry was posted in Music and tagged Alejandro Medeles, Dave Palmer, David Batteau, Eva Batalla-Mann, Gilberto Gonzalez, Grant R. Brimhall Library, Jeff Evans, Jon Gilutin, Leonard Cohen, Live at the Library, Marty Van Loan, Mini Bar Project, Perla Batalla, Rick Batalla, Thousand Oaks, Todd Hannigan on August 27, 2014 by joemiller.